Consider these four easy getaways to Mount Hood, Oregon Coast, downtown Portland and Columbia Gorge. Eggnog, cookies and new toys only go so far — winter break is upon us, which means kids will be home from school with cabin fever and a sugar rush. So why not take a winter staycation to the mountains or the coast, to dip your feet in snow or sand and get away from the hustle for just a bit? 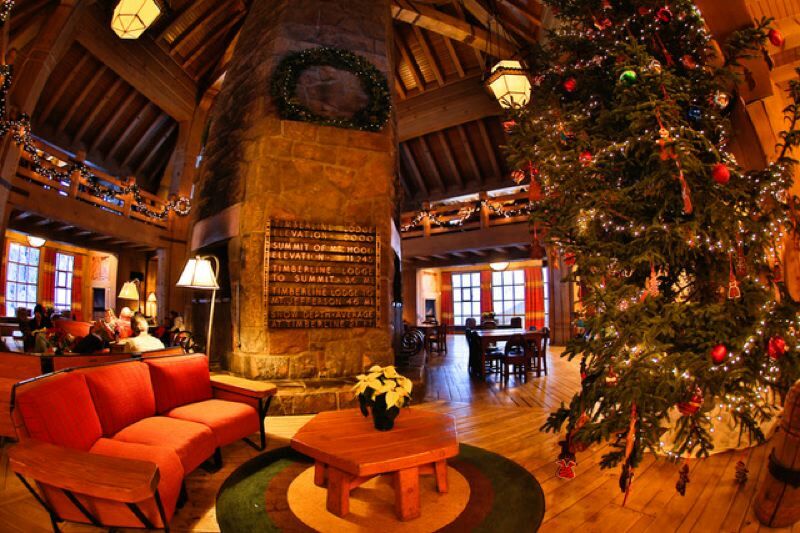 The historic Timberline Lodge gets fully decked out for the holidays, becoming a truly special place to visit even if you don't plan to ski. This season you can drive to the base of Timberline Lodge, an hour east of Portland, and hop on the resort shuttle, which runs on weekends and holidays from 10 a.m. to 6 p.m. through March. Explore the lodge and stay overnight (look for midweek specials), play in the snow, dine and cozy up with fireside cocoa or a heated outdoor pool or hot tub. It's a great way to recover after going snow tubing by day or cosmic tubing by night at Mt. Hood Skibowl, at the base of the mountain in Goverment Camp. You also can buy night ski tickets, learn-to-ski and snowboard packages, and group lessons. And, Mt. Hood Meadows is celebrating its 50th anniversary. Headlands Coastal Lodge & Spa in Pacific City, 90 minutes west of Portland, brings a bit of glamour to the town as the newest lodging property on the coast, opening its doors this month. The rustic boutique hotel is smack dab between Pelican Brewery and everyone's favorite climbing dune, Cape Kiwanda. With an oceanfront view of Haystack Rock from every room, deep soaking tubs and amenities including an "adventure concierge," the property is geared toward those who come to the coast to play outside — biking, hiking, fishing, boating and more. You probably can add stormwatching, long beach walks and hiking local trails to that list during the winter. Don't worry about the weather — with a spa, workout center and lobby with full restaurant, bar and fireside gathering areas, you can keep quite comfortable inside. There's been a major revitalization of downtown hotels lately, making it easy for not just visitors and business folks but locals to enjoy the scene as well. Home base for shopping, dining, drinking and checking out the latest cultural events, such as the Laika exhibit at the Portland Art Museum? Check. There's "The Nutcracker" at Keller Auditorium (through Dec. 24), and The Second City's version of "A Christmas Carol," called "Twist Your Dickens," at The Armory (through Dec. 31). There's every kind of party you can think of for New Year's Eve, including Pink Martini at the Arlene Schnitzer Concert Hall, a New Year's cruise on the Portland Spirit, and a night of '70s soft rock celebration at the Tony Starlight Ballroom in Southeast Portland. Most Portland restaurants are serving special menus for New Year's Eve, so inquire within. Stay at The Duniway — newly reopened in April after a stylish renovation, with Jackrabbit PDX as its restaurant anchor. The brand-new Hi-Lo Hotel, in a revitalized historic building three blocks from the waterfront, also is offering holiday discounts and packages. Alto Bajo restaurant and the chic Hi-Lo Bar anchor the space. If you haven't been in the Columbia River Gorge since the Eagle Creek Fire this past fall, now's the time to visit and show your love to the communities as they rebuild. Multnomah Lodge is now reopened, as are Vista House at Crown Point, Guy Talbot State Park and the short trail leading to Latourell Falls, and Bridal Veil State Park and trail. Hood River businesses are decked out for the holidays, and you can explore indoor attractions like Maryhill Museum, the Columbia Gorge Discovery Center and the fascinating Troutdale Historical Society, where you can learn how the Columbia River Highway was built 100 years ago. Continue eastward, and if you're really looking for vintage charm, book a stay at the lovingly restored Historic Balch Hotel in Dufur, 13 miles south of The Dalles. No kids are allowed here, and rooms are decorated with antique furniture and no TVs (but there is Wi-Fi). Enjoy views of Mount Hood, homemade chocolate cookies and time to breathe deep. Also make sure to sign up with Friends of the Gorge to be notified of their Gorge Trails Recovery Team actions in the spring.